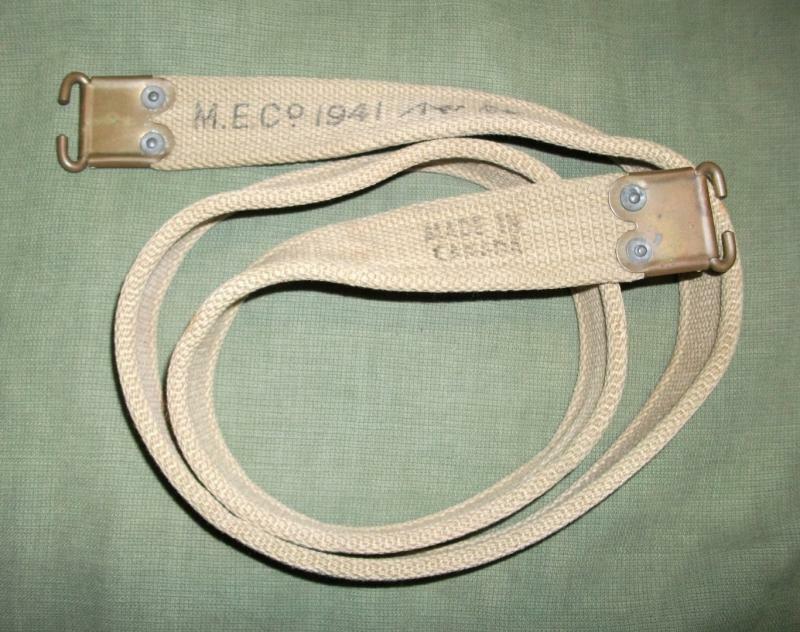 M.E.co webbing made in Canada? I have this 1941 dated British M.E. co sling which to me looks just like a British made sling... But it is stamped made in Canada on the other end. It is the same brownish colour of British webbing and has the same type of rivets and doesn't really look Canadian made to me at all. Has anyone seen this before? The stamp doesn't look like it was put on yesterday and I got it from a local surplus store a 10+ years ago which was in the pre internet collecting days I know some of the early Canadian stuff was brown but I have only ever seen 1940 dated stuff in this colour... Any thoughts? Re: M.E.co webbing made in Canada? Just a thought. During the war many contracts were let out to Canadian and other Commonwealth countries. MEC webbing may been among these contracts. In Canada, the Inspection Board of the United Kingdom and Canada checked the contracted goods to make sure they met contract specifications. The webbing may have been sub-contracted by MEC with the provision that the Canadian connection be marked as part of the proof process. Bill wrote: Just a thought. During the war many contracts were let out to Canadian and other Commonwealth countries. MEC webbing may been among these contracts. In Canada, the Inspection Board of the United Kingdom and Canada checked the contracted goods to make sure they met contract specifications. The webbing may have been sub-contracted by MEC with the provision that the Canadian connection be marked as part of the proof process. I don't think so. The Inspection Board's acceptance was on behalf of either the UK or Canada and no further mitigation was required. 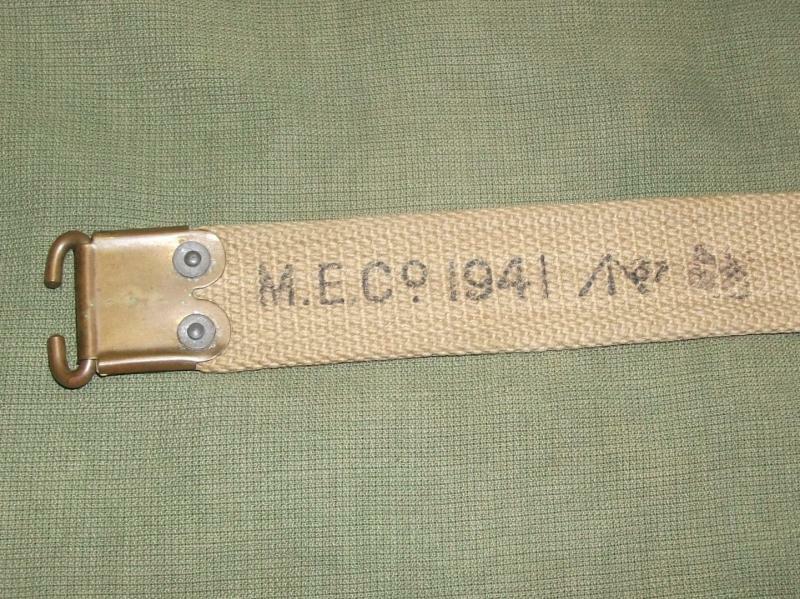 Webbing was not marked with country of origin during the war so this marking is postwar. The only requirement to mark the country of origin is a US import requirement. It is possible that someone was selling a load into the US and simply marked everything as being from Canada to simplify customs duties. Yeah it is a weird one... Thanks for the replies gents! I think you may have hit the nail on the head... 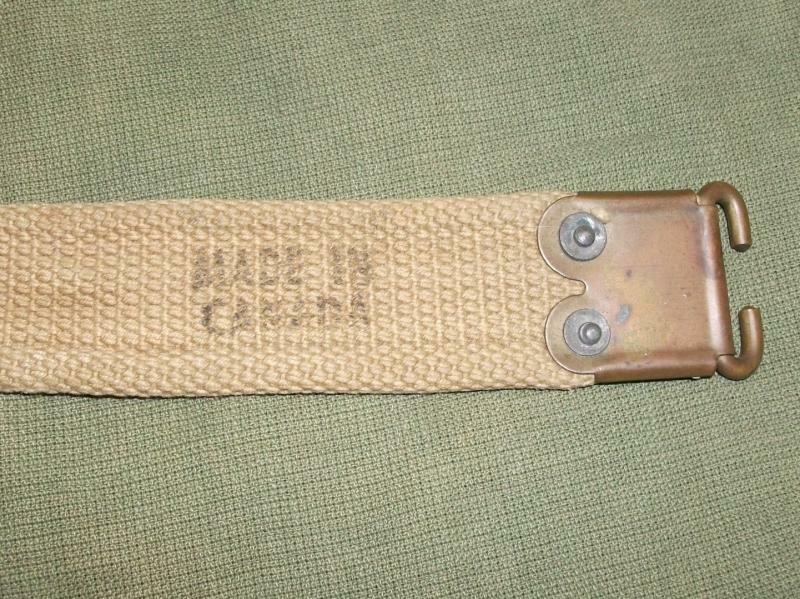 It definitely doesn't look Canadian made and now that you mention it I have also seen somewhere a pair of WW2 British made basic pouches with a made in England stamp onto the side them very similar to this one so maybe It was a post war import marking. Well I am not sure I will add any additional information here, but off I go anyway.... M.E. Co is Mills Equipment Company, a company in the UK. Not a "Canadian" manufacturer. This piece is clearly stamped with the broad arrow of the UK, not the "C" Broad arrow as used by the Canadian Government as their Acceptance mark. If this was a M.E. Co piece with the C broad arrow, I would would be raising an eyebrow. The fact it is stamped "Made in Canada" IMO certainly was done to make life less difficult as stated above by Clive. This is without a doubt an import mark and the sling is also definitely British made. Pretty much cut and dry IMO.